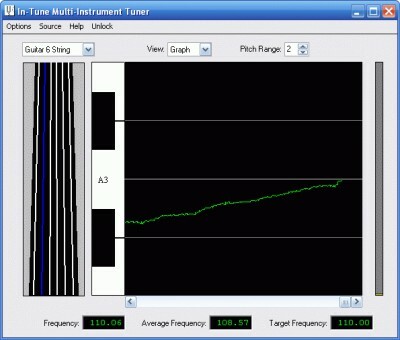 In-Tune Multi-Instrument Tuner 1.97 free download. In-Tune Multi-Instrument Tuner is a useful program with the help of which you can tune your musical instrument quickly and accurately with this digital tuner. In-Tune Multi-Instrument Tuner is a useful program with the help of which you can tune your musical instrument quickly and accurately with this digital tuner. Uses microphone or direct electric guitar input for tuning. Has choice of gauge and pitch graph views. Create and print calendars with this intuitive software. Music MasterWorks is a program that allows you edit, record and playback MIDI files. MusicGoals by Eye and Ear - ear training, sight reading, and music theory applied to piano, guitar, violin, viola, cello, and bass - MusicGoals offers study, practice, and testing to improve skills, gain knowledge of instruments and music theory, and train the musical ear.